For discerning readers out there, two things may look familiar here: the striped fabric and the pattern. I love them both dearly, so it seemed only fitting to birth their love child. 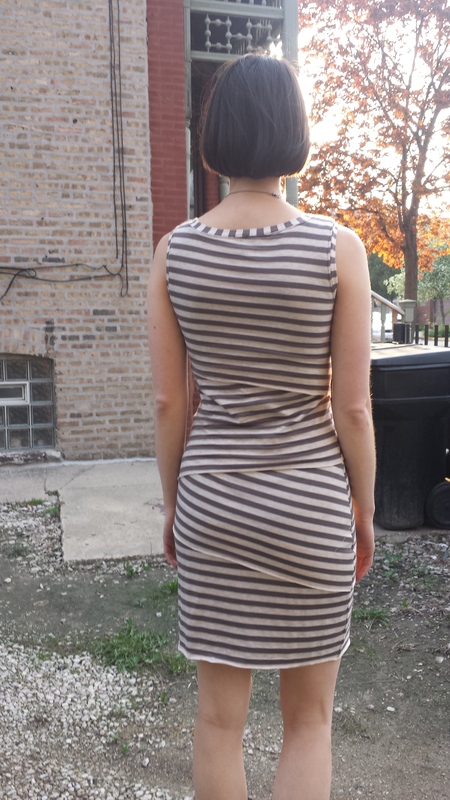 After a couple relaxing nights of cutting, pinning, and sewing, out popped my second iteration of Vogue 8904. This time around, I made the shorter version but kept it sleeveless for seasonal purposes. The dress took considerably less time overall since the pattern pieces were already cut out and ready to go. 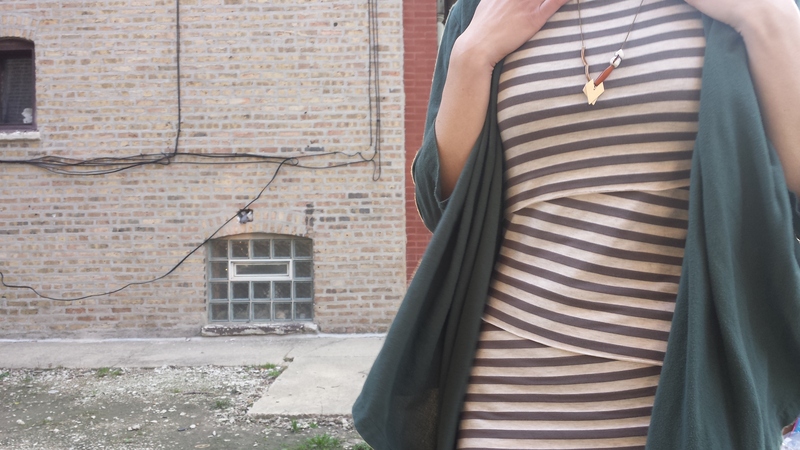 Hot tip: A cool iron works wonders on wrinkled, creased pattern pieces. I picked that info up from one of my Grainline patterns, so thanks, Jen! Side note: The left side of my face was still very much novocaine numb from an earlier dentist appointment, so please excuse any Derp Face in this post. Fabric: for the base layer (which is completely hidden by the shingles), I used a black knit bought for $3.95/yard at Textile Discount Outlet in Chicago. I’m not sure about the content, but it’s not too dissimilar in stretch from the top layers. For the shingles, I used my beloved striped bamboo-lycra blend from Girl Charlee. I sewed the neck binding in the flat, like the pattern directs. But then I CUT A HOLE in the binding attempting to trim the excess fabric down. (Insert sounds of glass shattering and a banshee scream.) Instead of unpicking an entire row of lightning-bolt stitches, I cut the neckband off as closely to the original stitching as I could. I then cut a new neckband, stitched it into a circle, press it in half lengthwise with wrong sides together, and sewed it on in the round. I’ve sewn a good handful of knit neckbands in the round now, and I’m pretty happy with this result. To anchor the neckband, I used an edgestitching foot to stitch verrrry closely just below the seam line. I sewed the armholes in the round for the hell of it, topstitching near the seam to anchor them. I might go back and unpick that stitching, though, since it’s a little wonky and uneven for my taste. We’ll see if I find the energy. Obviously this model’s beach house beats my backdrop: a gravel-filled lot where the garbage cans live. 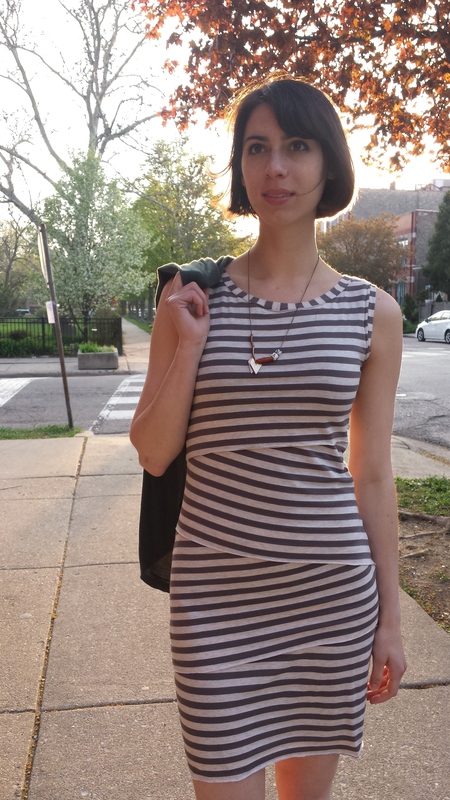 Styling aside, V8904 holds its own pretty well, especially considering that this dress cost less than $20 in fabric. The stripe matching ain’t perfect (although the top and bottom shingles are pretty good), but this dress is so forgiving that the imperfect stripes don’t stress me out. This little number will most likely make an appearance on my Me Made May feed… maybe in Vegas? What are your tried-and-true patterns? Oh, your dress is so much better than the Anthro version! The fabric is gorgeous. I’m jealous, I have so much trouble finding striped knits! Thanks! That bamboo rayon is really buttery–you should try to get your hands on some! I remember spending 20 minutes in the dressing room there, talking myself out of spending a fortune. Now I’m glad I did! You should totally give this pattern a try if you’re in the market! Yes, I have to add this one to my future sewing list, that vogue pattern is perfect for this! This looks fantastic! And way to remain calm, cool, and collected in the face of a terrifying slip of the scissors! I LOVE this! Great job. 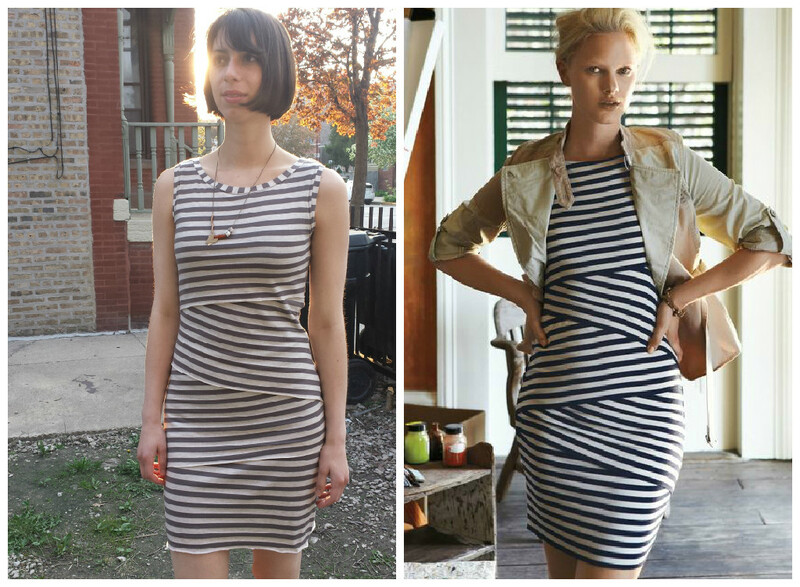 It’s so awesome when we can recreate RTW pieces that we love. 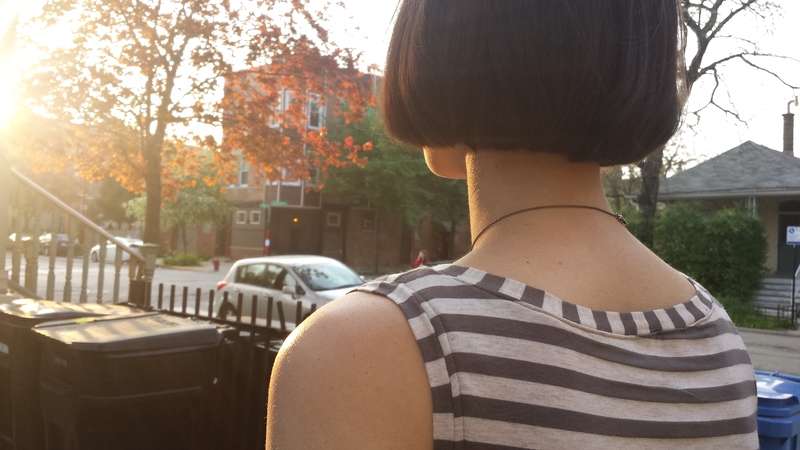 Totally unsolicited advice that you can completely ignore time: if the slight bunching at the base of your back happens often (it could just be the way you’re standing in the photo) you might try a swayback adjustment. Just pinch out a bit of the back on the pattern to take away the extra fabric. I ALWAYS have to make this adjustment because my back is more swayed than an old horse. Great tip! I added some length to that middle shingle/base layer since my torso is SO LONG. Next time I might keep the length but try the sway back adjustment. Thanks for the comment! I have the same problem. I need the length because I have a super long torso but then I have to take a horizontal pinch out of the back the compensate for the curve. When I make pants I usually have to take 3 inches out at the back center seam. It was life changing once I figured that out!